I've said before that my favorite people to teach are other teachers. Some people like to teach beginners - it's hard to match the joy of introducing a new sport, one that can be life changing, to eager students. Some folks like to teach advanced courses - the chance to do some paddling that is truly fun and exciting while welcoming some new blood into the brotherhood. For me, instructor training is the highest level of coaching. It's more involved, more complicated, and more rewarding than any other class. At its best it delves into the minutia of how to transfer information from one person to another; it dissects the human psyche to develop systems and stratagems to help students learn as quickly and efficiently as possible. It's down right complicated and that's what makes it fun. So this past weekend was a special treat as I assisted teaching an advanced open water ACA instructor certification course in Half Moon Bay. The advanced level cranks everything up a notch - the candidates are more experienced and motivated, the coaching is at a higher level, the conditions and locations are more challenging, overall it's just more fun! It was also a chance to work with Roger Schumann who I've known for years but never gotten to teach with before. And in addition, everyone in the class was a friend and paddling buddy. So it was really about workshopping with peers, where everyone is contributing ideas and sharing experiences. This being an advanced course we also got to go play in some fun conditions: a day of surfing 4-6' waves at Pillar Point; playing at Yellow Bluff and under the Golden Gate with4.5 knot currents; and a little rock gardening out at Pt. Diablo. The only disappointing thing about the weekend was the lack of wind - we needed at least 15 knots to create the proper conditions for the certification but in the three days of the course the wind never once reached that speed anywhere we could find. It's a sad day when December in San Francisco can't manage to stir up at least a little winter weather. But we made do with what we had and even at the end of a long weekend people were still playing around on the way back to CCK's classroom and the Princeton Boat Yard. Don't have a lot to say, it was just a nice day of paddling on the coast with friends. Waves were a little big, but I'll let the video do the talking on that. No, it's not just an attention grabbing title. But I'll get to the girls in a little bit. I just returned home from a 3-day paddling trip to the Channel Islands. Sorry I didn't hit my SPOT when we got to the beach but I had packed it away in the wrong place and didn't want to dig it out of the bottom of the truck after getting packed for the long drive home. But the trip went well and mild weather made for some easy paddling. This was the classic Channel Islands - the perfect 3 day crossing trip. We launched from Oxnard; paddled over to Anacapa Island to explore and camp for the night; paddled on to Santa Cruz Island the next day and spent the night there; finally we paddled back to Oxnard. It's a great intro to kayak camping, open crossings and cave exploration all wrapped up into a long weekend. Our crossing to Anacapa was under grey skies and calm winds. We headed straight for Frenchy's beach, the only place you are allowed to land, for a short break before working our way to the landing cove. The landing cove represents the biggest challenge of the trip - the dock is ten feet above the water. Hauling fully loaded boats up to 'land' is quite the feat. Pedro had devised a hoist system for a similar set up on Santa Barbara Island that would allow one person to do the task along - or at least that was the theory. This was our chance to test it out. But as we rounded the corner we were confronted with a group of bikini clad girls jumping off of said dock. Pedro now had plenty of hands to help haul up kayaks but for some reason chose to go it alone. The system was proven (it worked, but not pretty) with one boat but for the others I jumped up to give him a hand. The next day the lowering of kayaks from the dock was much easier (maybe it was the help of gravity, maybe the lack of distractions). We paddled through the famous arch and around the south side of Anacapa where we ran into a curious pod of sea lions - check out the video below. Then we crossed over to Santa Cruz, a relatively short crossing at four miles but notorious for headwinds that funnel through the gap. But winds stayed light and we made it into Scorpion Cove before the sun broke through and winds picked up. Since we all have played in the caves around the landing sight numerous times before we decided to take a hike up the canyon to find the Island Ironwood - a small tree that only grows on the Channel Islands. I've been to the islands dozens of times but never heard of this particular tree before - it's cool when a familiar place still has something new to discover. The contest is now over - I finished second :( But the story's still a good one, so read on. Help! I'm a finalist in Astral Buoyancy's 'Swim' story contest. It's my write up of my swim through an underwater cave on the lower Kern river a couple years ago. There are three finalists and Astral is letting votes on Facebook decide the winner. So take a quick moment and read the stories HERE and then go vote HERE. The winner gets a new Astral PFD but since I have plenty of PFD's if I win I will raffle it off for a good cause: The Jason Craig Recovery Fund. Time passes differently on the river. The days are longer, filled with more than should fit into a twenty-four hour period. Each minute seems to have endless possibilities. Every second gets stretched out to a tangible period of time with multiple thoughts and actions. This slowing of the passage of time is often a pleasing aspect to river travel, but it takes on a more extreme character during a crisis. We’ve all heard the stories: I was in that hole forever; I was under water for minutes; I thought I would never get unpinned. But usually these are exaggerations, the actual time spent under duress being far shorter than the true reality of the situation (or what our friends experienced while watching the action). But there is a difference between the time measured on a clock and what we experience on the river. Twenty seconds. That’s how much time I spent underwater, mostly in a cave. The helmet cam video proves it, though it is black for a lot of that time. It felt longer to me. And to my friends watching from shore. But I still had plenty of air in my lungs when I emerged so it might actually have only been twenty seconds. But those twenty seconds were filled to the brim with thoughts and reflections. 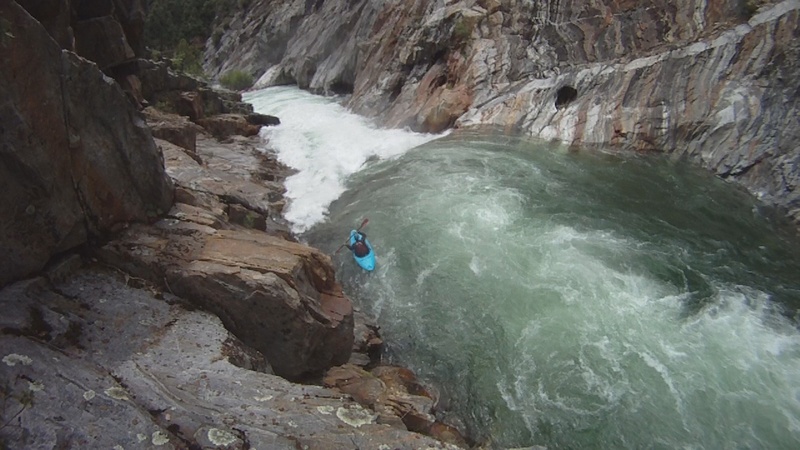 At the top of the rapid I am focused as the rocks and holes fly by at high speed. Then the final hole spins me around before the big drop and everything switches to slow motion. Once backwards I have time to debate whether I should try to spin around or just go with it. In a fraction of a second I weigh the pros and cons: if I miss the spin I’ll go over sideways and get recirced – or maybe surfed towards the cave; if I go over backwards I could still stay in the current and go past the cave. I decide to stay backwards and backpaddle for as much speed as possible. It doesn’t work. As I hit the bottom of the drop I feel my stern get turned sideways and the current grab my edge. I’m flipping with too much force to try to brace so I immediately go into a tuck, ready to roll before I’m upside down. In the white chaos I pause to see if I’m in the hole or flushing out. I feel the push of current that says I’m free and have time to note the power of that current as I begin my roll. Part way through I'm stopped – I hit the rock on my way up and know that the rock is above me, holding me down. I'm in the cave and the light quickly fades. I pull my skirt as my boat comes to a rest pushed against the back wall of the underwater cave. I know exactly where I am and quickly exit the boat, choosing to release my paddle since it will be no use to me now. I quickly scan my environment – I can see the light coming from upstream but the flow of water pushing against me makes that route unattainable. I reach to the ceiling to try to get above the water – but there is no air pocket to be found. I start to feel around with my hands, looking for a passage out or anything that might prove useful. I notice that my boat is still right next to me and I wonder if it has an air pocket of its own. I leave that for later since I still have plenty of air at the moment. As my search comes up empty part of my mind considers my situation in the abstract. I might actually die in here. There’s no flash of past memories, no thoughts of regret or curses for the cruelty of fate. There is acceptance, the understanding that this situation is simply a logical outcome of the choices and actions that led to it. This is what we choose to risk when we paddle at this level. I accept that risk but I am not ready to accept that final outcome so I focus back on the situation and how to change it. I feel a tug on my feet, the current going down and pulling me with it. I remember the story of a past boater swimming down and out this very cave; I remember that he got stuck on a tree branch in the process. But I know that to stay is to die so I push myself down, further down into the dark, further from the air above. Now the sensation of speed has momentarily returned. I feel the rush of the water and sense the walls flying past. But the darkness is complete and my fingers no longer reach the rock. I note that the tunnel seems long, that I’ve been moving fast for a long time now. Then I'm out. The current fades and openness returns. I orient myself and see light far above. As I slowly rise I know I am safe. I think back on my time in the cave and how my mortality was so starkly laid bare before me. I note how calm I stayed through it all and marvel at the clarity of my thoughts. As I am still rising towards the surface I realize that my friends are up there waiting and now I feel distress. What must they have been thinking during this long stretch of time? What horrors were their minds conjuring? What did I just put them through? And then I break the surface. I grab a lungful of new air and time resumes its normal flow. I still have a sense of purpose in swimming to the shore and I note my friends waiting there with throwbags in hand. I reach the rock and climb up and out of the river. Now safe my thoughts become a tangled mess: I am happy to be alive; I feel awful for my friends; I am pissed at myself for my mistake in execution; I am totally uncertain if my decision to run the rapid was foolish, stupid, brave or all of the above. The clarity and calmness are gone. But I am glad to trade the cool, detached awareness of imminent danger for the chaos and hassle of a complicated boat recovery. As long as time continues to flow on I am content to move at its pace. But those twenty seconds now account for a large portion of my life, what I learned and experienced during that time will stay with me forever. Those twenty seconds were full. Hold the phone - summer's not dead! After all my talk of switching into sea kayak mode I got a late night call from Matt saying he was planning to run the N Stan, leaving early the next morning. Amazing that such a great stretch of river still has water (barely) in the middle of September. It's only a two hour drive and Matt was planning on doing a bike shuttle but wanted a third person for the trip (three is much safer than two). Lydia was the third and it was her first time on the N Stan and her first time really creeking. The weather was suppose to be perfect and I hadn't packed away my whitewater gear quite yet so I joined in on the fun. And fun it was - a perfect day of carefree boating. 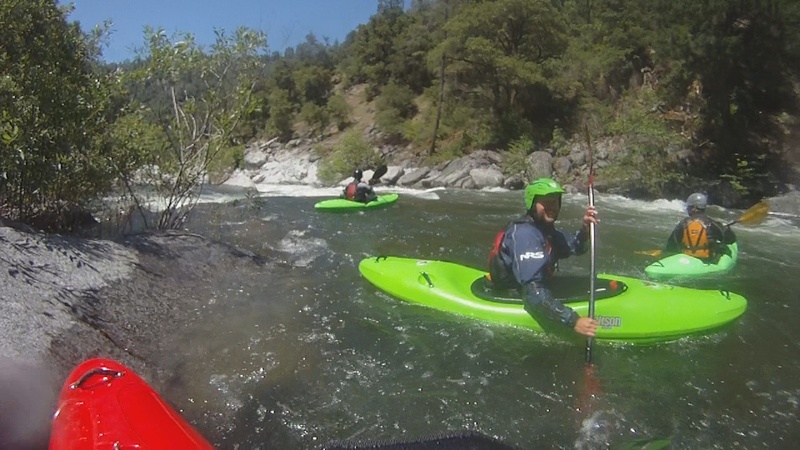 The low water changed a lot of the rapids but for the most part they still help up. The first rapid of the day is the toughest and it had a fair amount of pin and piton potential. (The actual first rapid at the put in is a class V+ nightmare that we didn't even consider at these flows). Matt and I charged it and we both had smooth lines that made it feel like we had accomplished something and also helped us to relax the rest of the day. The river itself was clear and picturesque and it had the right combination of pools and easy rapids with a few more technical ones thrown in. Lydia was picking things up as the day went along and really got the hang of low water, rocky creek paddling. The single biggest drop is actually the very last one, right below the bridge at the take out. Matt went first and briefly disappeared before popping up upright and giving the go ahead. I had the same basic ride but manage to keep my nose up enough to just get instantly surfed out the side of the hole. Lydia was dead on target but still subbed out and emerged upside down - but rolled to the cheers of the onlookers above. In fact a super kind older couple watching the action came over to show us the pictures they had taken and offered to email them to us. And after they asked how we planned to get back up to our car at the put in and we showed them the bike they offered to load all of us and our gear into their truck and drive us back up. Now that's the way you end the summer with style. Summer's over - let the sea kayaking begin! Out of staters often complain that California doesn't have seasons - not like they do back east or in the midwest. We just have nice weather year round. It's not exactly true but even if it were it is a strange thing to complain about. Our seasons may not be as dramatic but there are some key signs that summer has ended: we had rain in the forecast (only got a sprinkle, but that doesn't happen in the summer); most everything in the Sierras on Dreamflows is in the yellow; and the raft traffic on the South Fork American is only mildly annoying when teaching a class. Personally, my seasons are broken down by activity as much as weather. 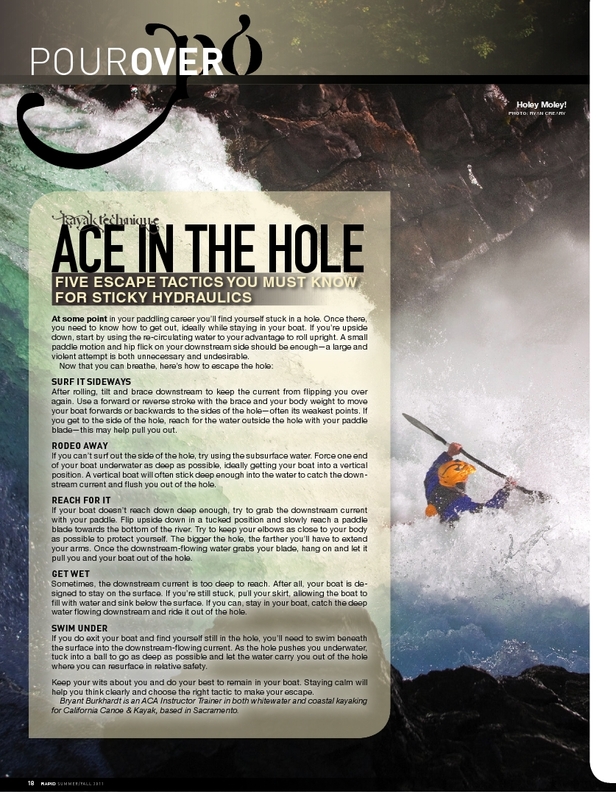 Spring and Summer are whitewater seasons - the rivers are flowing, the weather is warm and there are a ton of options. I might get out in my sea kayak for a trip or two, I may do some flatwater paddling on the lake, but primarily I'm in my creek boat. But by Fall most of the rivers are dry so I start to head off for more ocean paddling. The weather on the coast is at its best - light winds, less fog, warmer temps. This is the time to plan big trips or just head down to San Fran for the day. While I don't have any big expeditions in the works for this season I am looking forward to a couple of great sea kayak trips. First, I'll be heading down to the Channel Islands in a couple of weeks. Just a quick three day trip out and back to a couple islands I've been to many times. But The Channel Islands is where I started my paddling career and it is always special to head out there for some kayak camping. Then next month I will be heading back up to Oregon to teach at the Lumpy Waters Symposium. Last year was my first and it was the funnest trip of the fall. With some more friends headed up there this year it should be amazing. I can't over-emphasize how fantastic this type of symposium is for all those involved: the instructors learn from each other as much as the students learn us and together we have such a great time on the water and off. Then it looks like I will be leading an ACA Coastal Instructor cert course or two this fall/winter and then it will be time for the Golden Gate Sea Kayak Symposium before you know it. There's a difference between someone who paddles and a kayaker. Someone who paddles rents a boat and goes out on the lake for a couple hours for fun. They buy a boat at Costco to take out when the grandkids visit. They use 'oars' to slowly float down the river. 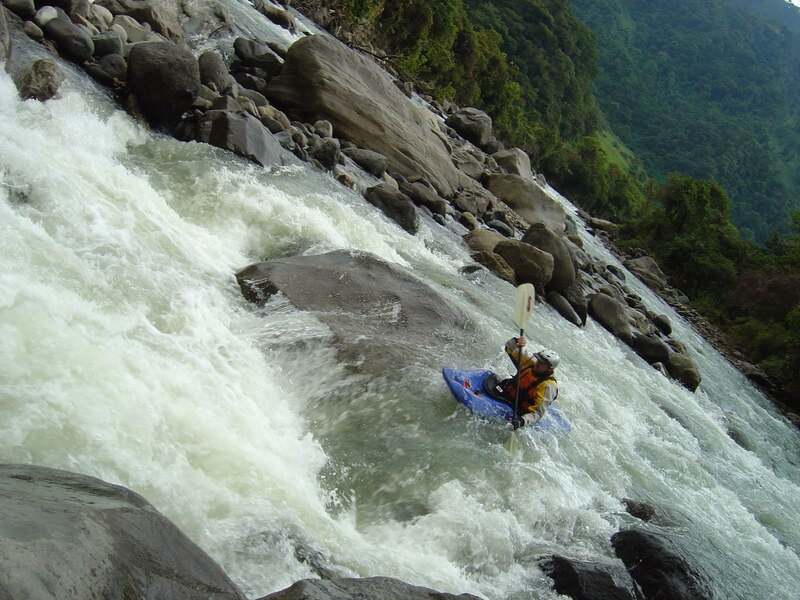 A kayaker is someone who is enthusiastic and dedicated to the sport. Don't get me wrong - people who paddle are great. I love to see the family taking a canoe out for a day of fun; the vacationers trying out a pedal drive boat for a couple hours; even some kids riding rec boats in through the small surf on a nice sandy beach. But I'm in the business of creating kayakers. When I go paddling that's who I want to paddle with. I want to sit around the campfire and talk paddling with those who want to understand what it means to kayak. 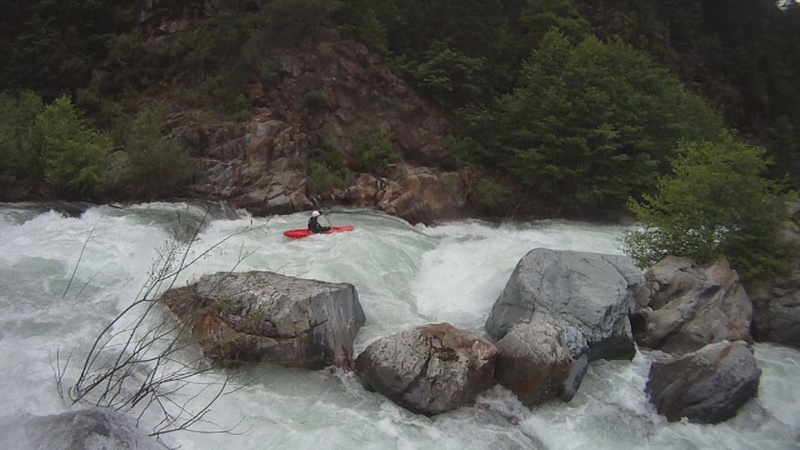 Kayakers are a separate group from the general population and we share a connection that you don't get from just going out for a paddle now and then. So what exactly makes someone a kayaker? That can be hard to define but the other night I was working with some ladies on sea kayak rescues and was struck by the thought that rescue practice is a defining activity. Real kayakers, whether flat water or ocean, learn and practice their rescues. That shows an understanding and commitment to the sport. Without rescue skills you are either confined to benign environments or you are a risk to yourself and others. 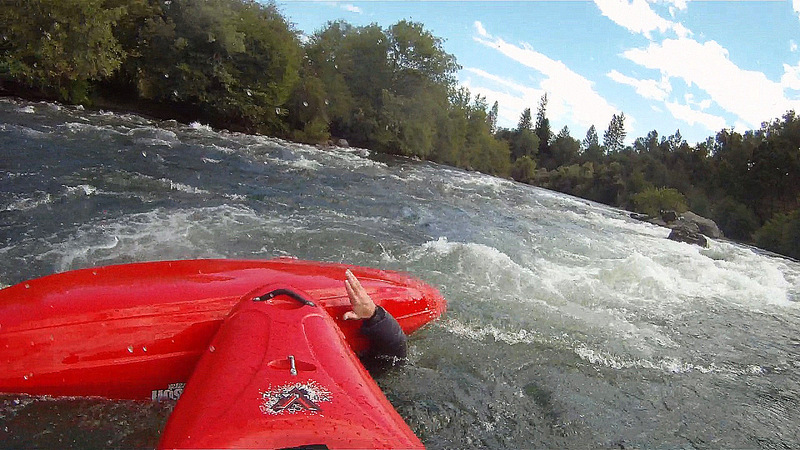 You don't have to know how to roll, you don't have to be able to do a paddle-float rescue in under 30 seconds. You just have to be aware enough to know that you need to learn some way to get back in your boat and you need to try to get better at doing so. On the river it's a little different. Whitewater has a convenient rating system. But you don't need to paddle class III (or IV or V) to be a kayaker. And again you don't need to have any specific rescue skill (rolls are good but I don't think they define you). For me, what makes you a kayaker on the river is the ability to lead a rapid. To be out in front and find your own way down, whether an easy class II or challenging class IV. You don't have to lead every rapid - we all follow people at times. But to take the personal responsibility to scout and rapid and find your own line is what kayaking is about. Those who can only follow others down the river are really just out for a paddle. 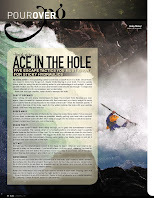 The latest issue of Rapid (click the link for the FREE online version) magazine has an article of mine on how to escape from holes. It's a short, 5 point summary of some methods to get out of a sticky hole. My original article was much longer but it didn't fit the magazine's format. At first the idea of cutting my article down so much seemed a little daunting and hard to take. But after seeing the final product I think the editor was on to something - it comes across well and I think it's just the right amount of information. But that being said, I still want to share the original article in all its unnecessary length and with a couple awesome illustrations by my friend Alex Horangic. And that works for beginners - most of the time. But eventually you’re going to hit that big monster of a hole that you should have avoided, you won’t have time to square up to it and once it flips you you won’t flush out. To prepare for this eventuality you need to know some strategies to get yourself out. 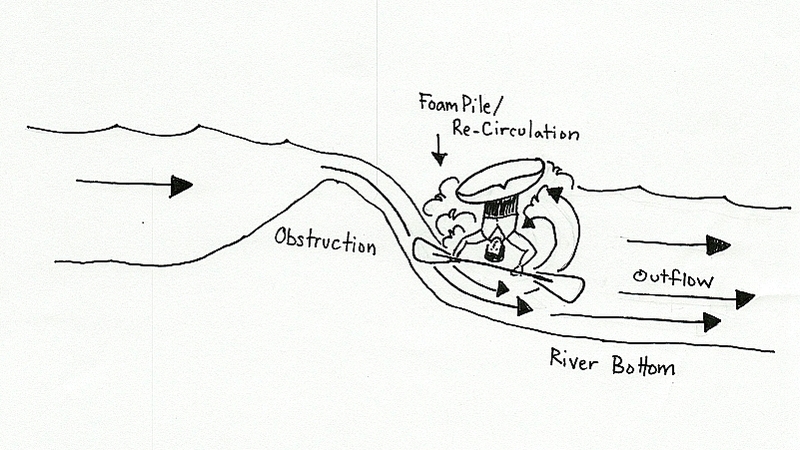 Quick review: a hole is a hydraulic feature where the water on the surface is re-circulating upstream. It’s the re-circulating surface level water that pushes you and your boat upstream, essentially holding you in the hole. 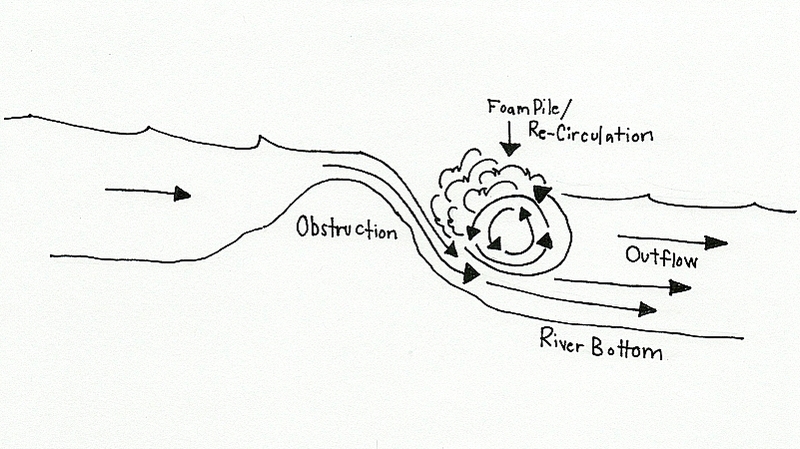 But underneath the upstream current the deeper water flows downstream – in large holes that downstream flow may be quite a ways below the surface. Here’s the situation: you hit a hole, flip and stick. What do you do now? The first thing to do when stuck in a hole is to keep your wits about you - and stay in your boat. Swimming is an option but a safer and generally smarter strategy is to first try to get out of the hole while staying in the boat. The ability to think clearly and use specific techniques to escape the hole often makes the difference between a short surf and an epic swim. Begin your exit strategy by tucking tight with your paddle in a set up position for the roll – this will protect your shoulders. 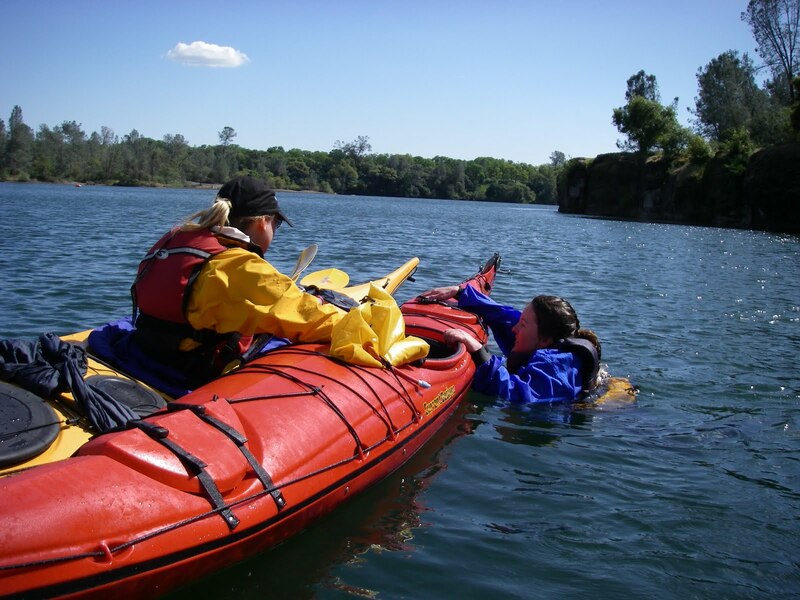 That re-circulating water we talked about earlier can be your friend – it’s circular, meaning that it will actually help roll your kayak back up if you go with the flow of the water. Don’t just throw out a roll attempt – work slowly and feel the direction the water wants to roll you and go with it using a small paddle motion and hip flick. This motion should bring you up sideways in the hole leading to a side surf. To stay upright in this side surf make sure you lean downstream as much as possible to keep the water that is pouring into the hole from catching you and flipping you again (and again and again – something referred to as window-shading). From the side surf you can make your first and safest attempt at getting out by paddling or ‘surfing’ your kayak to the side of the hole and escaping. Holes are generally weakest on the side so if you can make your way over there you might just wash out. Use your brace (high or low depending on what you’re most comfortable with and what the environment is like) to move yourself forward or backward to get to the side. Make sure to try both sides – if you can’t get out forwards don’t forget to try going backwards. If you can get yourself to the side of the hole don’t be afraid to reach for the water flowing by with your paddle – it will help to pull you out. Side surfing takes some practice and the best place for that is the ocean surf. If you don’t live near an ocean find a small hole that you know will release you and practice with that. If the side surf isn’t working – you can’t make it to the side or once there you can’t break out - then you have to be prepared to surf the hole straight up. Point your nose upstream into the hole and drive forward. 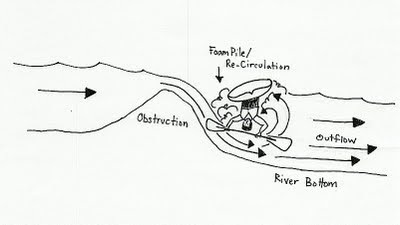 This will take you into the current of water that pours into the hole and hopefully that water will drive you and your boat down deep and take you under the hole with the downstream current. Yes, this action will likely flip you - so get a big breath and hold it before you dive in. If you’ve tried to surf you way into the heart of the hole and it didn’t spit you out then you are most likely going to begin a rodeo session whether you like it or not. This is not necessarily a bad thing. Try to ‘throw down’: get the ends of your boat into the current as much as you can, potentially getting your boat into a vertical position. 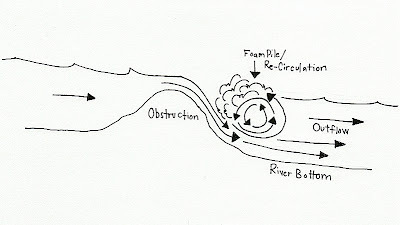 Often a vertical boat (especially a creek boat) will be sticking down into the water far enough to catch that downstream current. Many a boater has done a tail stand going through a hole and washed out the bottom still vertical. By rodeoing the hole the same motion can work to get you out after you’ve gotten stuck. This approach is generally a last resort since it puts your shoulders under strain. Since we know that the water underneath the hole is going downstream we can go down there and grab it. The first step is to flip upside down. Again, take that big breath before if you can. Once upside down start in a safe tucked position and slowly reach a paddle blade over your head (this means reaching towards the bottom of the river). Try to keep your elbows in as close to your body as possible but for really big holes you may have to extend your arms quite a ways. Once the downstream water grabs your blade you need to hang on and let it pull you and your boat downstream and out of the hole. During all these techniques you will be flipping and spinning and underwater at times. While it is generally good to stay in your boat sometimes it makes sense to wet exit while you still have some air in your lungs. The exact timing of when you decide to swim is a judgment call but the more you can mentally focus and remain calm the better your decisions will be. If you do exit your boat and find yourself still in the hole you will need to swim towards the downstream current once again. Most of the same techniques you tried in your boat can be tried without a boat. As you get pushed back upstream into the falling water tuck yourself into a ball and go as deep as you can and let that water carry you under and out the hole. With all these techniques you will most likely come out of the hole upside down. Don’t forget to roll up. I’ve seen many folks fight a hole and make it out but then pull their skirt because they weren’t aware they had escaped. It all comes back to keeping your wits about you. One of the best ways to work on your mental control is to do some playboating – working on your physical control. Practice in friendly situations so you will be prepared for the less friendly ones. Remember: knowing is half the battle. I officially retired from playing kayak polo after the world championships back in '06. Since then I have played occasionally - random tournaments or visits back down to LA where my old club still plays. But those occasions have been getting less frequent and I honestly don't remember the last time I played hard polo with a group of experienced players. But yesterday the guys in the San Francisco club were having a one-day training camp to get ready for Nationals next month. They needed some extra bodies to scrimmage against and they asked me to drive down for the day to play with them. While not my club, there is no other club that I have spent more time with in the polo world - from playing against them for years in local comps or playing with most of them on the national team. So I rinsed the cobwebs out of my boat, patched up one of my broken paddles and headed out for a long day of polo in the sun. The good news is that I can still play. I wasn't as sharp as I used to be - my aim was a little off, my reactions a little slow - but I felt like I kept up with the guys just fine. The not so good news is that fitness is a very specific thing. I've mostly been paddling rivers lately, with the one exception being my Lost Coast trip, and I've been biking and working out. So I feel quite strong. But polo is a different beast - it involves lots of quick sprints, constant maneuvering and fighting hard for position. During the warm up I hurt my elbow blocking a shot on goal - just a super stiff paddle transferring the shock of impact to my joint. Before long my forearms were pumped from gripping the paddle so hard (a light, easy grip doesn't work in this sport). By the end of the day most of my body was sore and I barely stayed awake for the lat night drive home. But the day was really fun. I do miss the camaraderie of playing on a team. With the SF guys it's like an old family out there - everyone knows each other a little too well; there's lots of jokes at each others' expense and there's some bickering and complaining, but mostly we just get on with it. Kayaking is largely an indiviualistic sport even if you don't normally do it alone. But when you're part of a team it completely changes the dynamic of you and your boat. It's something more paddlers should experience. A couple of days ago I got the news that a paddler I know died on Upper Cherry Creek. His name was Allen Satcher and I only got to paddle with him a few times. Like most paddlers he was very open and friendly on the river; he also seemed to be a very thoughtful person who willfully chose to be a positive force beyond the paddling world. He kept inviting me to go paddling even though my work schedule and personal lack of motivation to paddle hard stuff made me turn him down. He was out there paddling the rivers that I should have been paddling this season, with Upper Cherry being the number one run on my list for the past several years. I'm confident that if I had expressed interest in running it this year Allen would have been the first to invite me along. But mentally and physically I was not ready for the trip and didn't even try to go. 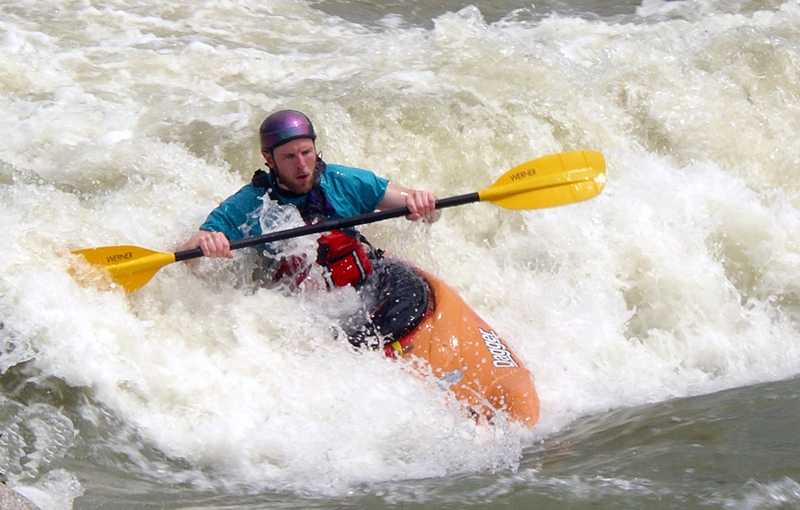 Paddling class V whitewater is a tricky thing and many folks have written about why we do it and how we accept the risk and what it means for us. Personally I don't have any deep thoughts or profound wisdom at the moment, maybe that will come later. I just see the pain left behind by the early loss of a great person. I've been taking a break from paddling class V since my own beat down earlier this summer. That break will definitely continue until my head is in a space where I really want to get back out there. I'm sure that time will come but until then I will paddle easier waters, spend time with my friends and focus on life off the water. Focus on the things that truly matter to me. 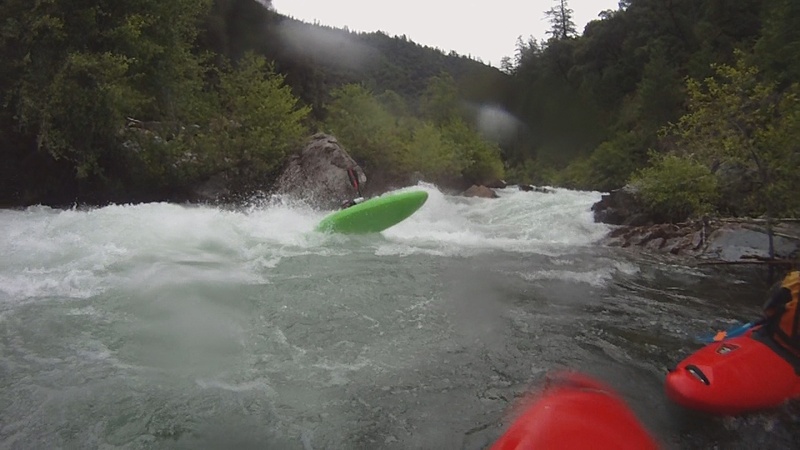 Here is a short clip of Allen (green boat/helmet) from our run down Slab Creek earlier this summer. He will be missed.